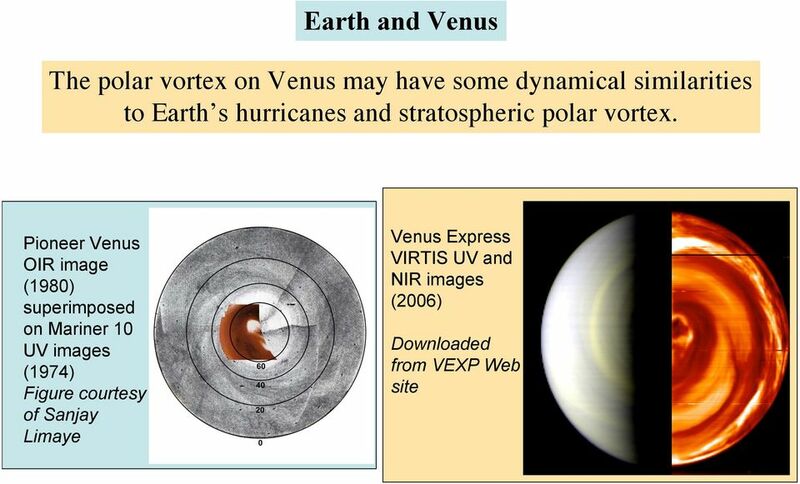 Download "Atmospheric Dynamics of Venus and Earth. 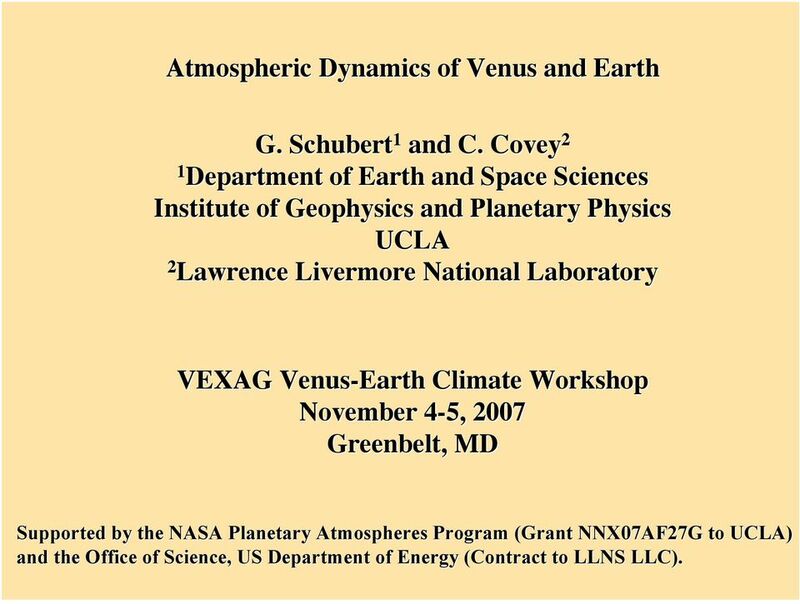 Institute of Geophysics and Planetary Physics UCLA 2 Lawrence Livermore National Laboratory"
1 Atmospheric Dynamics of Venus and Earth G. Schubert 1 and C. Covey 2 1 Department of Earth and Space Sciences Institute of Geophysics and Planetary Physics UCLA 2 Lawrence Livermore National Laboratory VEXAG Venus-Earth Climate Workshop November 4-5, 2007 Greenbelt, MD Supported by the NASA Planetary Atmospheres Program (Grant NNX07AF27G to UCLA) and the Office of Science, US Department of Energy (Contract to LLNS LLC). 2 Charge from VEXAG Steering Committee The Venus Exploration Advisory Group (VEXAG) steering committee has been discussing the connections between Earth and Venus studies and would like to highlight current understanding and possible opportunities for joint research in climate change. What do the dynamical regimes of Venus and Earth have in common? What accounts for the differences in the atmospheric dynamics of these planets? Why study Venus atmospheric dynamics to understand the dynamics of Earth s s atmosphere? 3 Major Dynamical Features of Earth s s Atmosphere Tropical Hadley cell confined to equatorial latitudes (±30 ). Ferrel cells and polar cells. Subtropical jet stream. Large-scale baroclinic eddies in mid-latitudes. Thermal tides. Planetary waves. Mesopause over the equator is colder than over the winter pole. Seasonal variations. 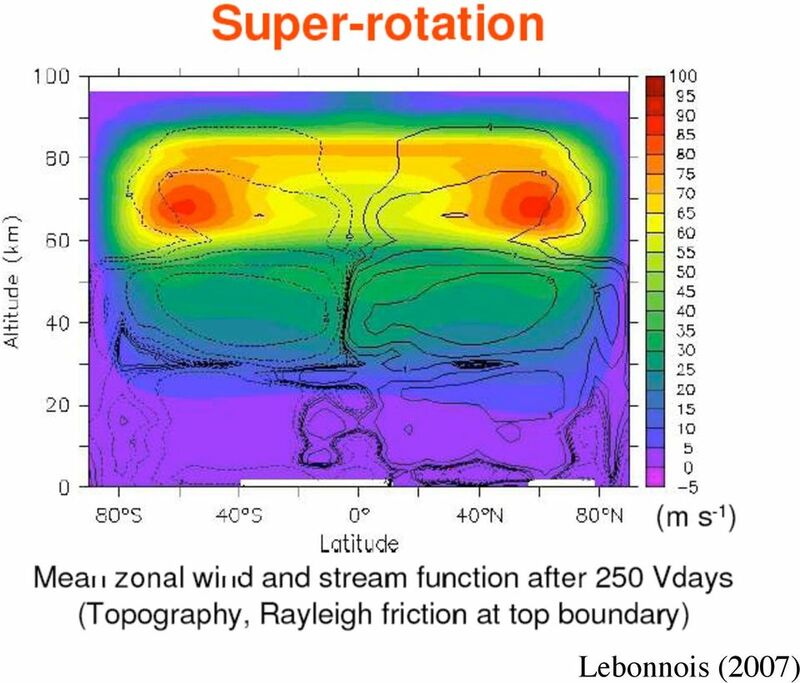 Major Dynamical Features of Venus Atmosphere Superrotation. Polar vortex. High latitude cloud level jet stream. Cloud level Hadley cell extending to polar latitudes? Thermal tides? Planetary waves. Mesospheric ( km) temperature increase from equator to the pole. Seasonal variations? 4 Earth and Venus There may be more similarity between Earth and Venus than hitherto appreciated. Earth s circulation is driven from below by solar heating variations. On Venus, solar heating is focused at cloud heights where T, p conditions are earthlike. The cloud level circulation on Venus might have some similar characteristics as circulation on Earth. 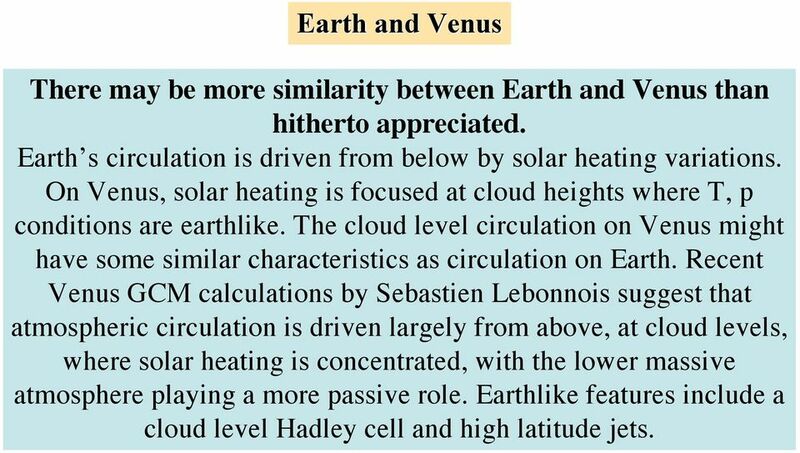 Recent Venus GCM calculations by Sebastien Lebonnois suggest that atmospheric circulation is driven largely from above, at cloud levels, where solar heating is concentrated, with the lower massive atmosphere playing a more passive role. Earthlike features include a cloud level Hadley cell and high latitude jets. 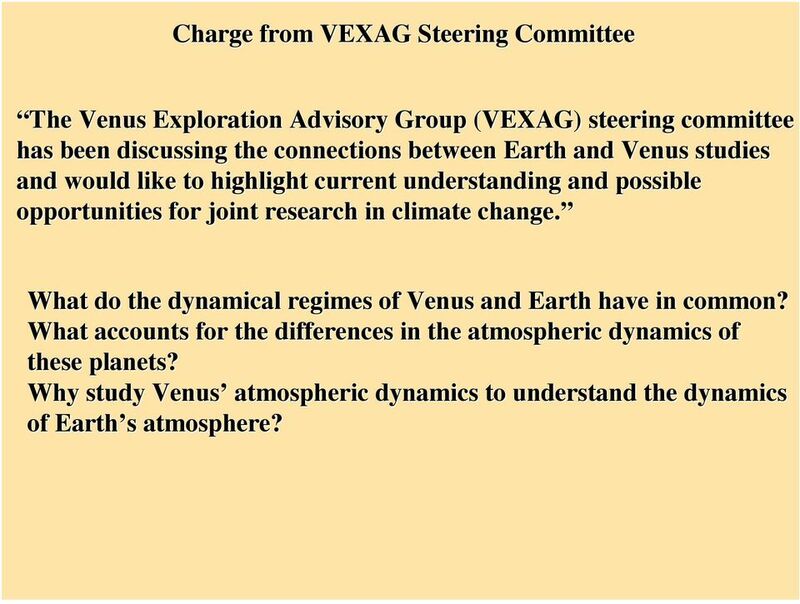 7 Charge from VEXAG Steering Committee The Venus Exploration Advisory Group (VEXAG) steering committee has been discussing the connections between Earth and Venus studies, and would like to highlight current understanding and possible opportunities for joint research in climate change. What do the dynamical regimes of Venus and Earth have in common? What accounts for the differences in the atmospheric dynamics of these planets? Why study Venus atmospheric dynamics to understand the dynamics of Earth s s atmosphere? 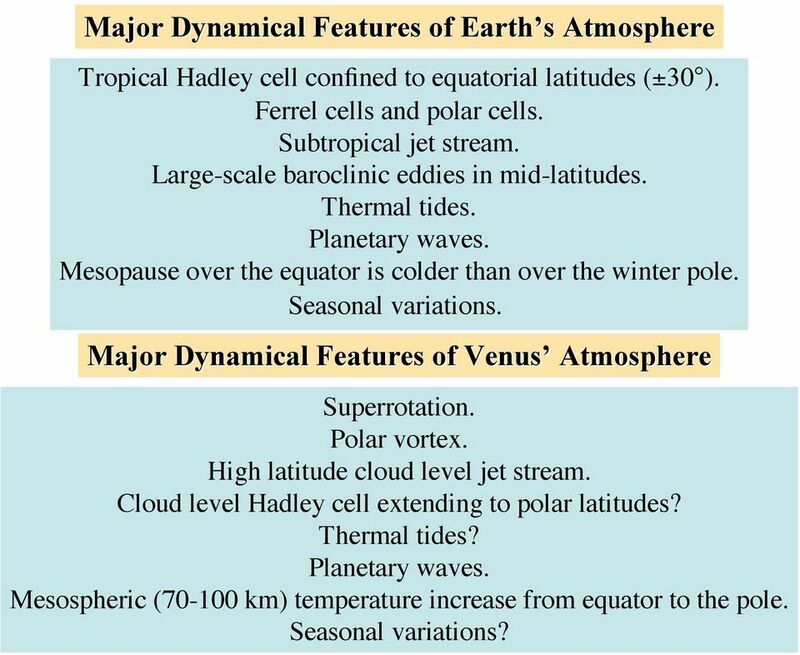 8 Why study Venus atmospheric dynamics to understand the dynamics of Earth s s atmosphere? Earth s s Future Climate: Clues from other Worlds It is clear that we don t need to study Venus atmosphere to understand the atmosphere of the present Earth. However, we do need to study Venus atmosphere to understand, more completely and with greater confidence, the possible consequences of future climate changes on Earth due, for example, to global warming. What will Earth s climate be like in the future? How can we predict the new climatic regimes on a warmer Earth? Climate is a consequence of radiative heating and cooling of the atmosphere and of the circulations established in response to these forcings. 9 The answers to the above questions require an understanding of how the dynamics of our atmosphere will respond to the changes in forcing. 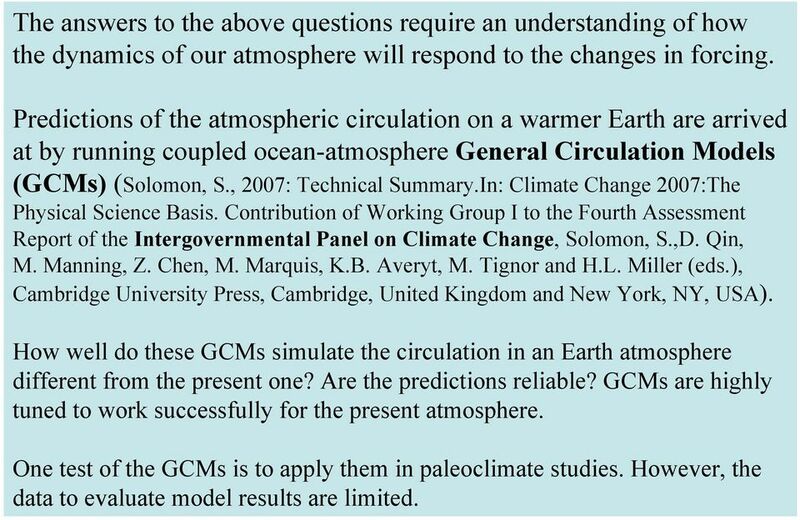 Predictions of the atmospheric circulation on a warmer Earth are arrived at by running coupled ocean-atmosphere General Circulation Models (GCMs) (Solomon, S., 2007: Technical Summary.In: Climate Change 2007:The Physical Science Basis. Contribution of Working Group I to the Fourth Assessment Report of the Intergovernmental Panel on Climate Change, Solomon, S.,D. Qin, M. Manning, Z. Chen, M. Marquis, K.B. Averyt, M. Tignor and H.L. Miller (eds. ), Cambridge University Press, Cambridge, United Kingdom and New York, NY, USA). How well do these GCMs simulate the circulation in an Earth atmosphere different from the present one? Are the predictions reliable? GCMs are highly tuned to work successfully for the present atmosphere. One test of the GCMs is to apply them in paleoclimate studies. However, the data to evaluate model results are limited. 10 Another test of the GCMs (and of our understanding of atmospheric dynamical processes) is to apply them to other planetary atmospheres. In this case data are limited only by the resources we choose to direct to planetary observations. A GCM is only a tool. What we re really after is enhanced understanding of what will be the dynamics of an Earth atmosphere very different from the present one. Other planetary atmospheres are living examples of atmospheres different from Earth s present atmosphere, so we must understand how they work. Only then will we be able to claim that we might be able to understand a future Earth atmosphere. Venus atmosphere is a prime target in all this. It is fundamentally different from Earth s present atmosphere in many ways, composition, mass, etc., and we don t yet understand its dynamics. 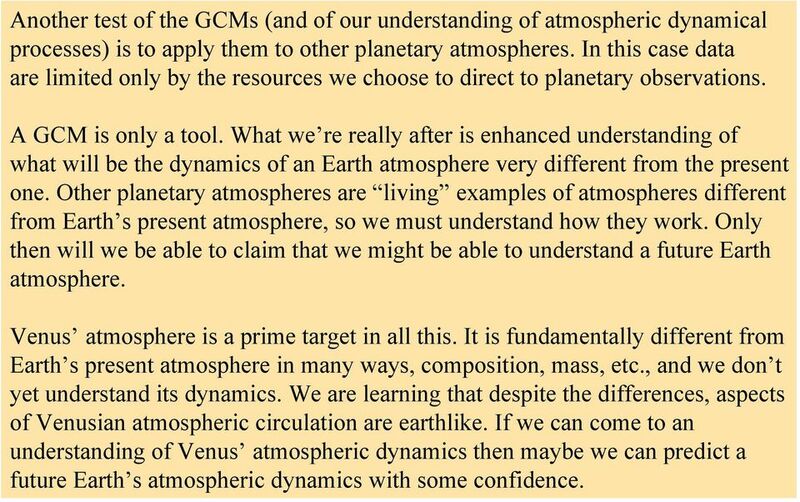 We are learning that despite the differences, aspects of Venusian atmospheric circulation are earthlike. If we can come to an understanding of Venus atmospheric dynamics then maybe we can predict a future Earth s atmospheric dynamics with some confidence. 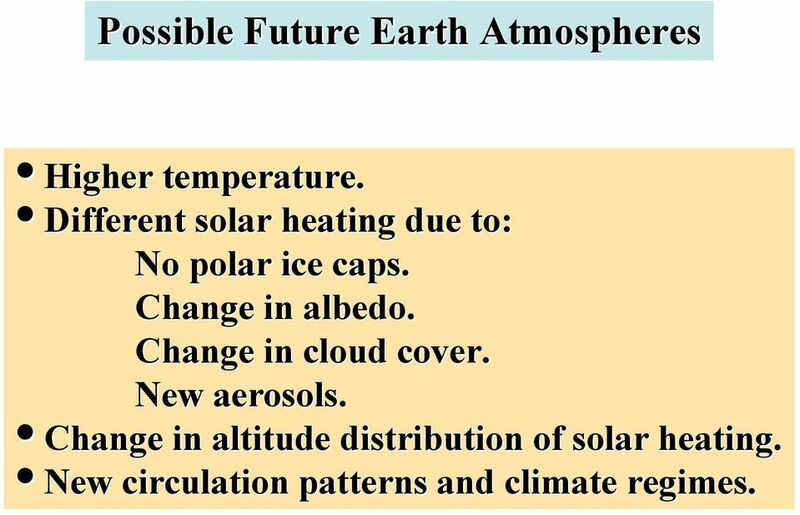 11 Possible Future Earth Atmospheres Higher temperature. Different solar heating due to: No polar ice caps. Change in albedo. Change in cloud cover. New aerosols. Change in altitude distribution of solar heating. New circulation patterns and climate regimes. 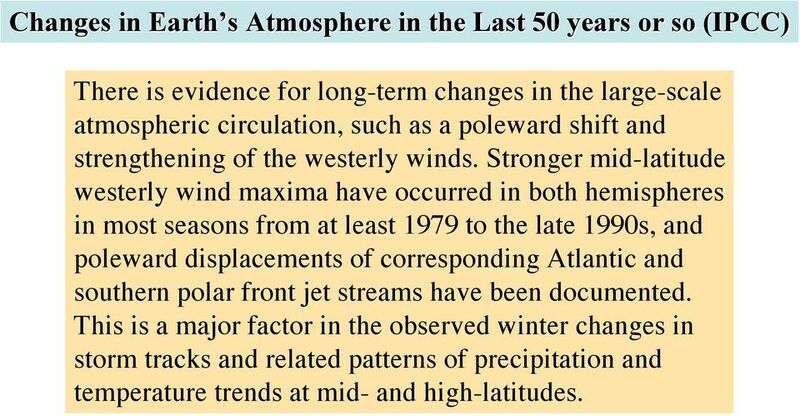 12 Changes in Earth s s Atmosphere in the Last 50 years or so (IPCC) There is evidence for long-term changes in the large-scale atmospheric circulation, such as a poleward shift and strengthening of the westerly winds. Stronger mid-latitude westerly wind maxima have occurred in both hemispheres in most seasons from at least 1979 to the late 1990s, and poleward displacements of corresponding Atlantic and southern polar front jet streams have been documented. This is a major factor in the observed winter changes in storm tracks and related patterns of precipitation and temperature trends at mid- and high-latitudes. 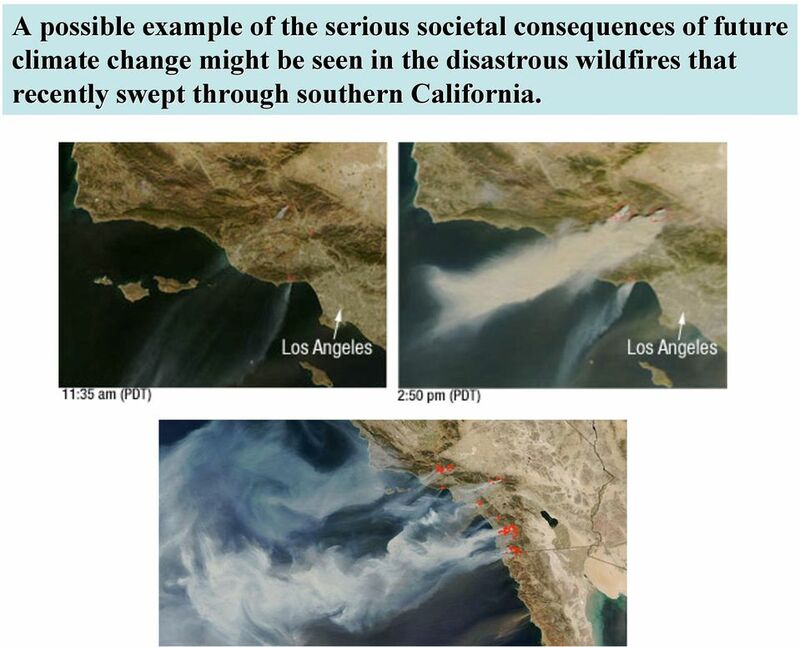 13 A possible example of the serious societal consequences of future climate change might be seen in the disastrous wildfires that recently swept through southern California. 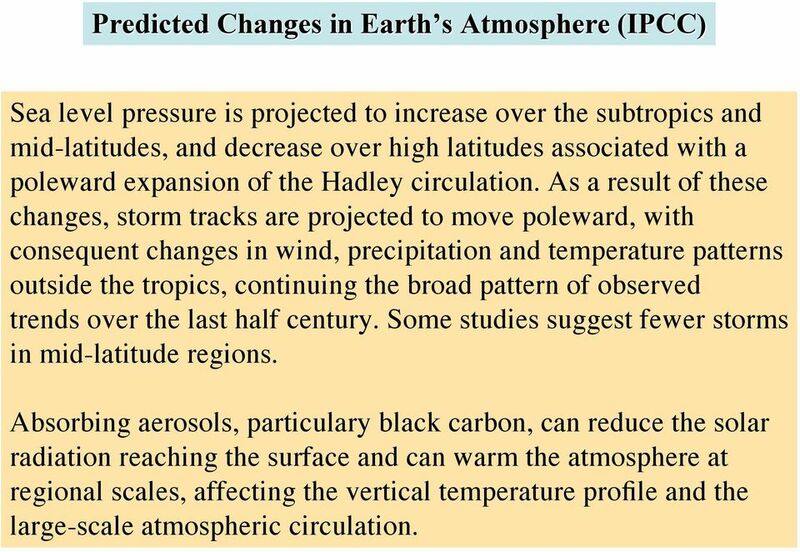 14 Predicted Changes in Earth s s Atmosphere (IPCC) Sea level pressure is projected to increase over the subtropics and mid-latitudes, and decrease over high latitudes associated with a poleward expansion of the Hadley circulation. As a result of these changes, storm tracks are projected to move poleward, with consequent changes in wind, precipitation and temperature patterns outside the tropics, continuing the broad pattern of observed trends over the last half century. Some studies suggest fewer storms in mid-latitude regions. Absorbing aerosols, particulary black carbon, can reduce the solar radiation reaching the surface and can warm the atmosphere at regional scales, affecting the vertical temperature profile and the large-scale atmospheric circulation. 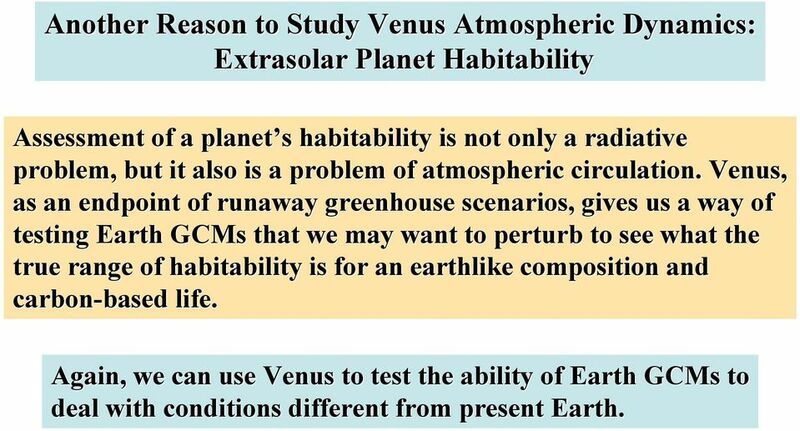 15 Another Reason to Study Venus Atmospheric Dynamics: Extrasolar Planet Habitability Assessment of a planet s s habitability is not only a radiative problem, but it also is a problem of atmospheric circulation. Venus, as an endpoint of runaway greenhouse scenarios, gives us a way of testing Earth GCMs that we may want to perturb to see what the true range of habitability is for an earthlike composition and carbon-based life. Again, we can use Venus to test the ability of Earth GCMs to deal with conditions different from present Earth. 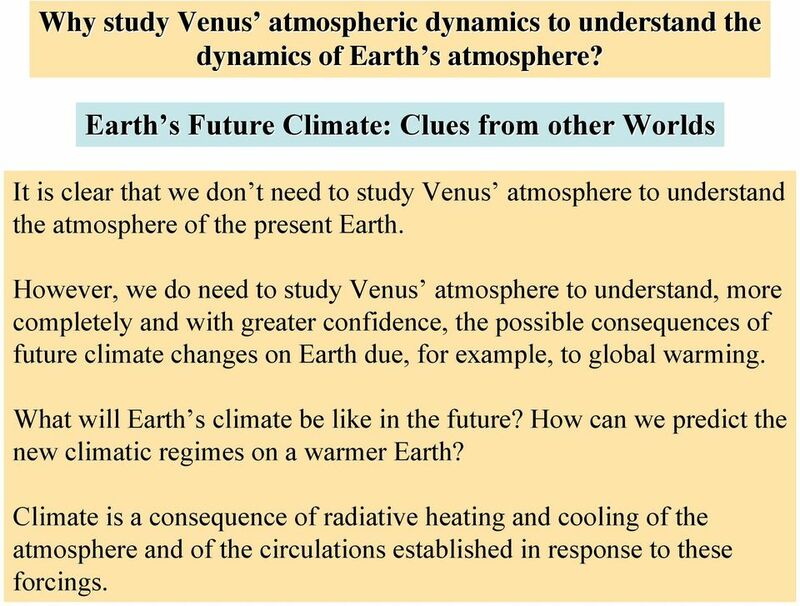 16 CONCLUSIONS Why study Venus (dynamics) from an Earth perspective? Because it can tell us about future Earth atmospheric circulations. Because it can help us assess extrasolar planet habitability. To evaluate the ability of Earth GCMs to simulate atmospheric circulations under conditions different from the present. To learn about Venus itself. To enhance our understanding of atmospheric dynamics. SOME STARTS Venus atmospheric dynamics project at UCLA using the NCAR Community Atmosphere Model (CAM). Caltech utilization of the NCAR Weather Research & Forecast (WRF) GCM. 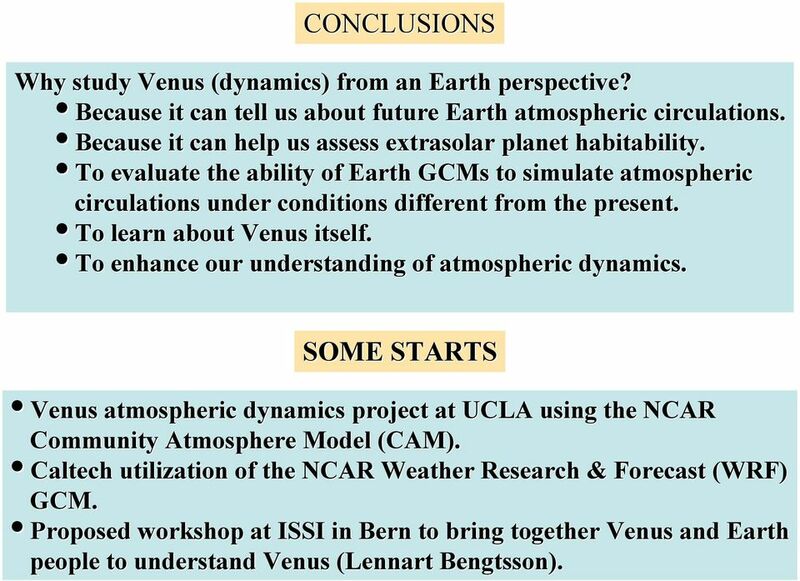 Proposed workshop at ISSI in Bern to bring together Venus and Earth people to understand Venus (Lennart( Bengtsson). 17 Venus Exploration Goals, Objectives, Investigations, and Priorities: 2007 Goal 3. What does Venus tell us about the fate of Earth s s environment? Objective 1. Search for evidence of past global climate change on Venus. Objective 2. Search for evidence of past changes in interior dynamics.. Objective 3. Characterize the greenhouse effect Objective 4...determine the evolution of planetary atmospheres. Antarctic Temperature and Sea Ice Trends over the Last Century High latitude regions of the Earth (the Arctic and Antarctic) have been considered as bellwethers in the detection of global climate change.